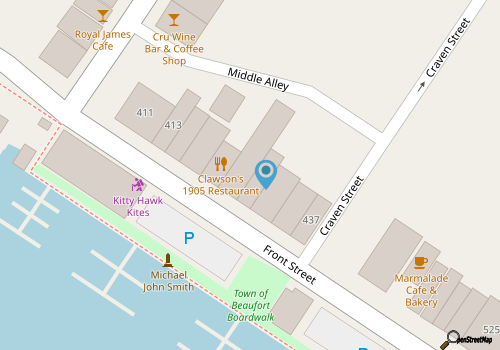 As the name would suggest, Clawson’s 1905 Restaurant has more than a century of history as a local grocery store, (and then a restaurant), in one of the oldest buildings in Downtown Beaufort. The effortlessly historic and cool interior is lined with wooden booths and tables, naturally brick-lined walls, and plenty of charm in the form of old antiques serving as authentic décor. The menu is extensive, and includes a host of southern staples, fresh seafood, sandwiches and burgers, and everything in between, and beer fans will be equally impressed with the long list of available brews, including a number of local and regional varieties on tap. Seafood and Crystal Coast standards trickle in throughout the lunch, dinner and brunch menus, with stand-outs like homemade Pimento Cheese and Buffalo Shrimp, and weekend evenings are a fine time to swing by during a tour of Downtown Beaufort to see if there’s any live music or entertainment on deck in addition to a decadent bar menu. Clawson’s 1905 can also be rented for private events, and catering is available for local wedding receptions or other celebrations as well. History rich, with plenty of flavorful options to choose from, Clawson’s 1905 is considered a “must-visit” for any Downtown Beaufort visitor. Call (252) 728-2133 for current hours.